Spring Meadow Farm is located on beautiful, rolling pastures outside of Larkspur, Colorado, just 40 miles south of Denver and 20 miles north of Colorado Springs. This comfortable, relaxed but efficient farm is run by husband and wife team, Fred and Jan Wehrli. Spring Meadow Farm is a major player in the rebuilding of the Rocky Mountain Horse breed out here in Colorado. We are helping to increase the interest in the breed with our finely bred and gentle animals. We do not utilize artificial insemination at our farm and have chosen instead to do our breeding naturally. We are currently standing The Great “Gatsby,” our 22-year old Rocky Mountain stallion siring a high percentage of Chocolate with Flaxen manes & tails. His gentle manners, sweet disposition, and performance have made him a favorite with all visitors. 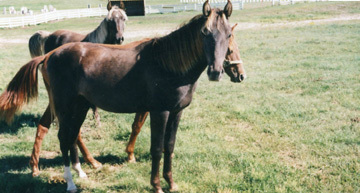 These qualities along with the smooth Rocky Mountain Gait are being passed to his foals. We purchased The Great “Gatsby, a Chocolate/Flax, as a colt in 1996. He is the epitome of the breed and has an awesome disposition and gait. Right now, we have a total of 8 horses on the farm for sale, all under saddle. Breedings scheduled at the farm are generally done during the months of April, May, and June in an attempt to get the majority of the foals on the ground in March, April, and May. The “Special Handling” from birth seems to be what makes the horses at Spring Meadow Farm different. Since we are a Breeding Farm and not Horse Traders, every horse we sell was born here and has a healthy dose of our “Special Handling.” We handle every foal as soon after birth as possible. In fact, on occasion, we have helped deliver them. It is an awesome feeling to be there when that foal is being born and knowing that you had something to do with it. We will spend much of the day handling the foal the day it is born giving it its fair share of “Special Handling.” From then on, until they leave for a new home, they get a lot of attention and a lot of love. The entire farm encompasses 105 acres—35 acres comprise the original farm which was purchased in 1984. It has neat, tidy building structures surrounded by rolling, open pasture land. The fencing on the farm is white four-rail fence using 1"x 6" planks. It is painted with a mixture of white farm & ranch enamel paint and linseed oil. The main reason that the we chose the white plank fencing is the aesthetic appeal that it offers, and additionally, it has proven to be a very safe fence for the farm. Injuries have been noticeably lessened since we replaced our old wire fence with the wood plank fencing. The farm currently utilizes one small indoor arena measuring 36’ x 50’, two round pens and an 80’ x 160’ rectangular dressage-driving arena and a dressage-riding arena, both used for training. 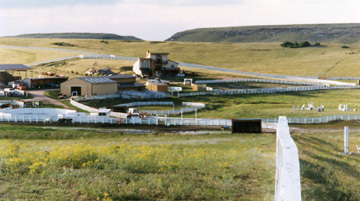 One of the round pens has a diameter of 30 feet; the other one has a diameter of 60 feet, both with five foot tall solid sides. The farm’s 36’ x 60’ eight stall barn is constructed of 1” x 12” boards with 1” x 3” batting, using rough-cut lumber. 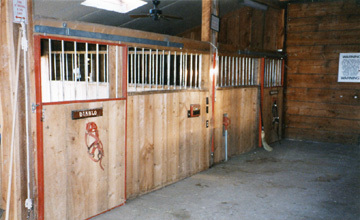 The farm also utilizes a board and bat wood shed for storing shavings and its many run-ins shed in all of the various pastures. The other barn is 50’ x 50’ and has five horse stalls with outside runs and also serves as the farm’s shop and warehouse. Hay storage is done in a 30’ x 60’ hay barn that will store up to 180 tons of hay. Spring Meadow Farm is staffed only by Jan, Fred and Armondo. Jan and Armondo facilitate all of the feed analysis and responsibilities. Jan handles the general training of most of the younger horses. Armondo does most of the daily riding, fence repairs and such. 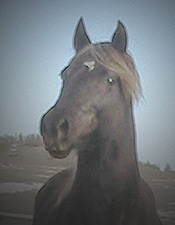 Dusty, one of our stallions, was trained by Fred for driving and he has been an active competitor. Fred is a past President of the Colorado Driving Society and the Central Colorado Horse Association as well as Board Member and past President of the Colorado Horse Council. 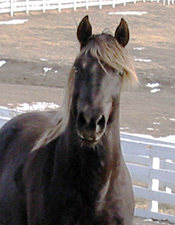 Jan is President of the Rocky Mountain Regional - Rocky Mountain Horse Assn. and a Board Member & Treasurer of the Central Colorado Horse Assn. Both are active members of the Parker-Elizabeth Riding Club. 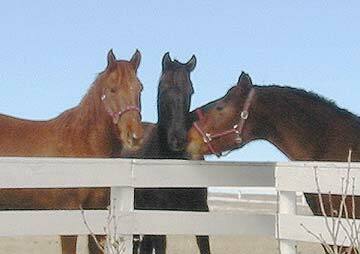 Young horses are started and are for sale at the farm and visitors are always welcome any time. Spring Meadow Farm maintains a comfortable, efficient training, competition and sales style that keeps them pleasantly busy all the time.